Like many lodge owners in Nepal, Hem Bahadur from Chomrung has greatly benefited from a decade of increasing numbers of trekkers visiting the Annapurna region of Nepal. He has improved the quality of his lodge with the addition of hot showers and proper toilets, but Hem also realized that plastic bags and mineral water bottles accumulating in his backyard were not sustainable, littering the village, the river and the fields all around. So quietly, he and 2 other colleagues from Chomrung Village convinced the local lodge association to ban the sale and the use of mineral water bottles in their area. The ban has been successfully running for 12 years. Plastic single-use bags and mineral water bottles are among the worst polluters in mountain environments: they take a few hundred years to dissolve (if they ever do); they are hazardous for human health, cattle and wildlife and it ‘s close to impossible to recycling plastic in remote mountainous areas while they are easily avoidable. Realizing the urgency to protect Nepal’s pristine Himalayas from this plastic pollution and inspired by the Chomrung Experience, a group of Nepali activists from the non for profit organization ‘’Plastic Free Himalaya’’ launched in 2013 a national campaign aimed at putting Nepal Himalayas on the world map as a plastic (bags and mineral water bottles) free zone. The implementation of such a ban should be the responsibility of the National Parks or Conservation Areas that cover most trekking areas. These two entities collect entry fees from all foreign visitors to protect the environment and have promoted useful rules inside their boundaries for a more responsible tourism. 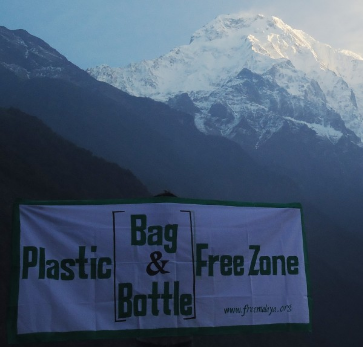 Therefore, Plastic Free Himalaya is calling for the next logical step which is a ban on all single use plastic bags and mineral water bottles as has been implemented in most National Parks worldwide and in neighboring countries like Bangladesh, Bhutan or Sikkim (India). Today the concept of “sustainable tourism” is on every travel brochure, every website, every advertisement. “Sustainable” means a responsible management of both natural and human resources, ‘’the capacity to support, maintain and ensure an increase of visitors on the long term in the best possible conditions’’. If we want the trekking industry of Nepal to be sustainable, to be here for the long term and to provide local employment that would keep youth in villages, it is time for the Government and its agencies to take a radical stance on plastic. Yes, ‘’visit Nepal once is not enough” as Nepal Tourist Board advertising goes, but to make sure that tourists will come back, the government should provide basic infrastructures - safe airports and planes, roads, electricity, water - while the Parks and tourist entrepreneurs should provide clean and safe food and lodging for trekkers AND for porters, as well as a clean environment. Those are the minimal requirements for Nepal to keep enjoying today’s 35% of returning visitors, a huge asset for the country. According to experts, on average, 50% of wastes are organic and could be composted while aluminum cans and tins can be recycled since they have a real market value. But how do we dispose of plastic bags and bottles that will still be around a few hundred years ? While traveling in Mustang a couple of years ago, I was impressed by the Annapurna Conservation Area (ACAP) signboard on the main courtyard of the remote former capital Lomanthang. I quote from memory: “Tourists, please respect our pristine nature and protect our environment: don’t litter, re-use, recycle.” But just around the corner, just along the wall of the ancient city, laid a huge dumping site with a horrendous smell. What should be done? Isn’t it time to take drastic action? Or should we just wait for the waste to pervade the entire ancient city and for the tourists to desert this outstanding tourist destination? Of course, banning plastic bags and bottle will not solve all problems of waste management in the mountains but it will be a first step in the right direction, showing tourists and local populations that preserving the environment is possible, does not cost much, that tourism could be a sustainable business. Tourists, if informed in advance of the ban, are ready to abide by the rule as they have done in the Annapurna Sanctuary area since 12 years. Today, like in Chomrung and more recently in Ilam and in Myagdi regions, local communities have taken upon themselves to implement a ban on plastic. But on the national level, the ban should be implemented by the government with the support of all stakeholders of the tourist industry, especially the National Parks, ACAP, etc. He is a French national who has been residing in Nepal for three decades. A Writer, a specialist of the Tibetan culture and an enthusiastic trekker, he has along these years visited most regions of the Himalayas on foot, from Bhutan to Nepal and Ladakh. As an activist for nature preservation, he has been very involved in Nepal in lobbying for the preservation of the Himalaya and for the development of a sustainable tourism. He is a senior advisor to the campaign ‘’Plastic Free Himalaya’’.